For a Reliable Tow Service in Frisco give us a call. We are a Family Owned, Local North Texas Towing Service and understand how frustrating it can be to need a Tow Truck. We want to help you with that frustration by making the Towing as simple and easy as possible. Our Experienced Wrecker Drivers will make sure you are back on the road as quickly as possible. For Immediate Tow Truck Service in Frisco, Prosper, Celina, Little Elm, The Colony and the surrounding Communities call 972-810-7701! 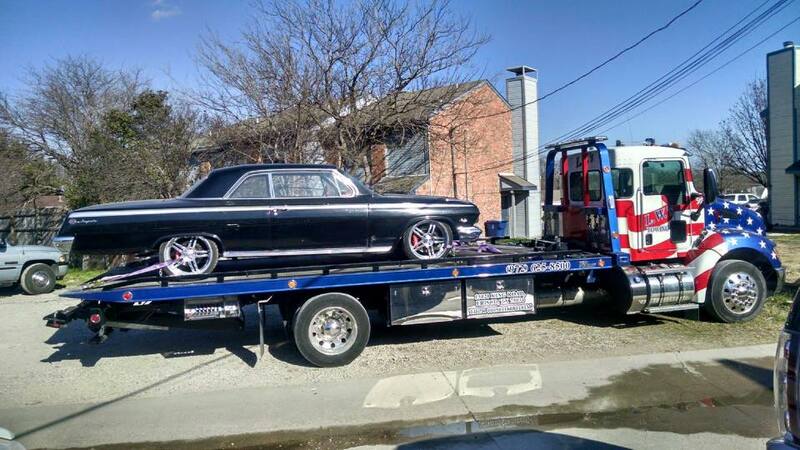 Why use Frisco Towing Service? 24/7 Exceptional Service! We know that Car issues can happen at any time day or night, and are as close as a phone call to help you with your Vehicle problem. 24/7 Roadside Assistance. There's nothing more frustrating than heading to work in Frisco and having a flat or your Truck decide to stop running, so we offer Frisco Roadside Assistance and our Tow Truck Drivers are able to help you decide whether you need a Tow or if they can fix your problem on the Road. Locksmith Car Services. We've all done it and when you lock your keys in your car, we will be there quickly to unlock your Vehicle and help you to get back on the Road. Emergency Towing. We provide Emergency Towing for Accidents and other Emergency situations. Friendly Frisco Wrecker Service. When you are stressed due to Vehicle Issues the last thing you need is an unfriendly Tow Truck Driver so we work hard to hire only the Friendliest and most Experienced Drivers on the Road. Local North Texas Wrecker Service. We've lived and worked in North Texas for years, and call it Home. Serving North Texas. We offer Tow Truck Services in Prosper, Celina, Frisco, Little Elm, The Colony and the surrounding Communities. Honest Texas Values. We will treat you like Family, providing you with a level of Service that will leave a lasting impression for all the right reasons. Affordable Tow Rates. Our Tow Service is here to serve the community and our Tow Truck Rates are some of the most affordable in all of North Texas. Fully Insured and Licensed. We will treat your Vehicle with care and are properly Licensed and Insured for the State of Texas. Currently we provide all types of Tow Truck Services including raised Wheel Wrecker Service for Cars and Pick-ups, Flat Bed Towing, Heavy Duty Towing, and even Low Boy Trailer Services for extended Vehicles. We can Tow 18 Wheelers, RV's, Limousines, and any other Heavy Duty Towing. We also offer Full Roadside Assistance in Prosper, Celina, Frisco, Little Elm, The Colony and the surrounding Communities. Our Experienced Wrecker Drivers will help you to decide what needs to be done to get you back on the Road. As a Locally Owned Frisco Tow Service, we are a family Business with years of Experience. We take Pride in our Work and will work hard to earn your Business. If you own a Business and your Local Prosper, Celina, Little Elm, The Colony or Frisco Business needs Tow Service for your Parking Lot, we would love to talk with you about what we offer. We are here to serve you and will work with you to handle any abandoned cars or other Parking issues. Contact us today at 972-810-7701 to speak with one of our dedicated Staff and one of our Tow Trucks will arrive shortly. Frisco Towing Service offers complete Heavy Duty Towing for Big Rigs, 18 Wheelers, Fire Trucks, Charter Buses, RV's, Limousines and more! We have the Big Rig Tow Trucks to Tow just about anything, and even have Lowboy Trailers to handle Heavy Equipment Towing.